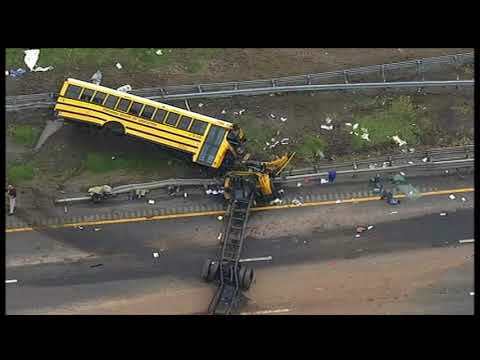 Video from a New Jersey Department of Transportation camera shows the driver of a school bus made a U-turn on the highway before it hit a dump truck in a crash that killed two people. Three school buses were taking middle school students to a field trip Thursday when the crash occurred on Highway 80 in northern New Jersey. The video shows one bus missed an exit and the driver navigated across the lanes of traffic to make a U-turn in an area designated for emergency vehicles, WNBC-TV reported. A teacher and fifth-grade student died in the crash, officials said. Several others, including the driver, were hurt. The crash tore off the bus' front end and undercarriage, and closed traffic across all lanes. The bus carried 38 students and seven adults from East Brook Middle School in Paramus, N.J. They were on their way to Waterloo Village, a recreated 19th-century town about 40 miles west of the school, when it crashed. The teacher was identified as Jennifer Williamson, 51, a social studies teacher who'd taught for more than 20 years. Officials have not yet released the name of the student or bus driver. NJ.com reported federal transportation records show the company that owned the dump truck, Mendez Trucking, has received hundreds of safety violations and has been involved in eight crashes, including five with injuries. Most were related to vehicle maintenance.